Melt the butter over very low heat. Remove from heat. 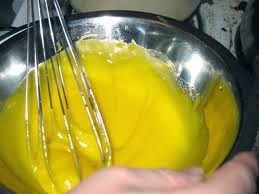 Add mayonnaise and whip with a WIRE WHISK ONLY until well-blended. Add more Mayo for a thicker sauce at this point. Add lemon juice; use more than 2 teaspoons for a more tart sauce. Do NOT return to heat right after adding lemon juice or sauce will separate. Add salt and paprika to taste. Blend well. Serve warm or at room temperature. To reheat, warm very slowly in a double boiler and beat with WIRE WHISK. Delicious with artichokes, eggs benedict, etc. NOTE: You can make a batch and keep in covered jar in refrigerator to have on hand. Will keep indefinitely.